Our business in Ovilla, Texas, specializes in mutimedia apparel decorating providing you with durable team spirit shirts customized by our expert design staff. 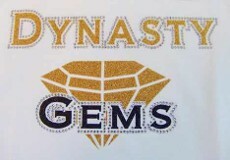 The Cat's Meow Embroidery & Design is proud to create custom appliqué shirts featuring rhinestones, as well as tackle twill uniforms for baseball teams, team parents, or cheerleaders. By choosing our services, you'll be able to make sure your team is represented properly. Contact us at (972) 617-5816 to learn more about our services. Whether you are interested in making some special team spirit shirts for a team, looking for someone to make amazing team uniforms or put your corportate logo on a shirt, hat or mug, the staff at The Cat's Meow Embroidery & Design is prepared to help you. We have more than 15 years of experience making all types of clothing and accessories for sports teams, dancers, and more. While at home with her children, owner Mary Petrichenko began dabbling in crafts. She eventually began working with cheerleading uniforms and decided to start this business in1993 to offer her services to the community. We are known for providing personalized services and always having quick turnaround. to request embroidery services for team spirit shirts.